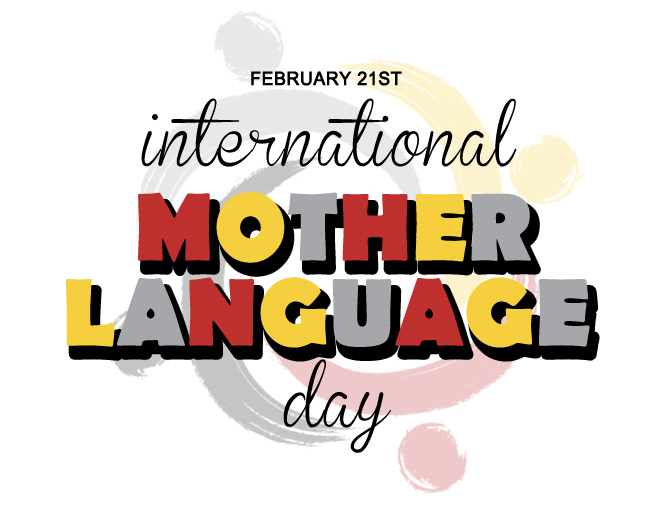 The U.N. observes International Mother Language Day on February 21st. Поздравляем с Международным днем ​​родного языка! Bonne Journée Internationale de la Langue Maternelle! سعيد اليوم الدولي للغة الأم! ¡Feliz Día Internacional de la Lengua Materna! Above: Happy International Mother Language Day in all six official U.N. languages. When I think of the word “endangered,” I immediately associate it with endangered species– the giant panda, Indian elephant, snow leopard, or Bengal tiger– but did you know that 43% of languages are endangered? Of the 6,000 known languages, a very small percentage are taught and used in international communication and in large companies and organizations. As such, many are at risk of fading away completely. Each language has its own value and can express distinct ideas. The vocabulary that exists in a certain language can communicate so much about the culture of those who speak it. Though languages can be similar to each other and often stem from common ancestors, they have many unique aspects. Thus, translation, though useful, can never be perfectly precise, and this is why it is valuable to speak more than one language. You may be wondering: is language really related to science? The answer is yes, and in more ways than just one. First of all, linguistic diversity is underrepresented in discussions of women in science. Take the recent commemoration of the Fourth International Day of Women and Girls in Science, for example. Though participants’ mother tongues ranged from French, to Hungarian, to Spanish, to Mandarin, to Arabic, and more, all official affairs were conducted in English. Of course, to some extent this has to do with practicality: conducting affairs in each mother tongue represented would have required numerous translators. On the other hand, though, to truly capture the diversity of women in science, a multitude of languages should be honored and used. Thus, in the 2019 Girls in Science Outcome Document following the Girls’ Panel, we called for enhanced diversity in conversations, including but not limited to linguistic diversity. Second, being able to communicate in more than one language is a valuable skill for people in many scientific professions. The most obvious example of a profession where it benefits one to speak many languages is medicine, as this ability allows one to communicate with a more diverse group of patients. In addition, scientific researchers, specifically those in social science fields, benefit from speaking more than one language, as they can connect with greater proportions of the population. All STEM professionals benefit to some extent from knowing many languages, as this enables them to connect with fellow professionals across the world who are carrying out similar work and collaborate to achieve goals. Third, the skills acquired through learning a language are applicable to sciences. Improved communication and critical skills are beneficial to all careers, but specifically to a career in STEM, where interpersonal skills are the basis of successful collaborations. On this International Mother Language Day, I encourage you to think about what languages you know and the people you have been able to connect with because of these languages. And consider: how would learning a new language benefit you? What language might you like to learn and why? Feel free to comment below, and share your mother language in addition to your ideas!